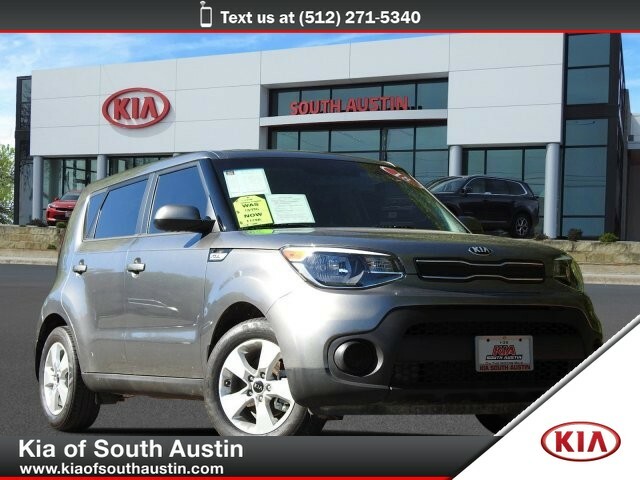 2018 Kia Soul 6-Speed Automatic Transmission CARFAX 1-Owner Kia of South Austin. Located on the Magnificent Motor Mile! 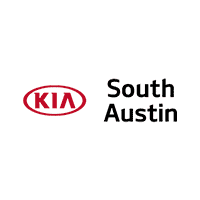 5306 IH-35 South, Austin, Texas 78745 512-444-6635 www.kiaofsouthaustin.com MECHANICAL 1.6L Gas Direct Injection (GDI) 4-cyl Engine 6-Speed Automatic Transmission 16 Alloy Wheels SAFETY Dual Front Advanced Airbags Front Seat-Mounted Side Airbags Full-Length Side Curtain Airbags Lower Anchors and Tethers for Children (LATCH) Anti-Lock Braking System (ABS) w/ Brake Assist (BAS) Traction Control System (TCS) Electronic Stability Control (ESC) Vehicle Stability Management (VSM) Hill-start Assist Control (HAC) Tire Pressure Monitoring System (TPMS) INTERIOR, COMFORT & CONVENIENCE Air Conditioning Power Windows, Door Locks & Outside Mirrors AM/FM/MP3 Audio System SIRIUSXM w/free 3-mo. subscription* Bluetooth Wireless Technology USB / Auxiliary Input Jacks Woven & Tricot Cloth Seat Trim Multi-Adjustable Driver's Seat 60/40 Split Folding Rear Seats Center Console w/ Armrest and Storage Bin Remote Keyless Entry Tilt & Telescopic Steering Column Steering Wheel Controls (Bluetooth/Audio/Cruise) EXTERIOR Roof Rack Ready (Mounting Points) Rear Privacy Glass Carpeted Floor Mats $125.00 Cargo Net $50.00 Mud Guards Kia of South Austin. Located on the Magnificent Motor Mile! 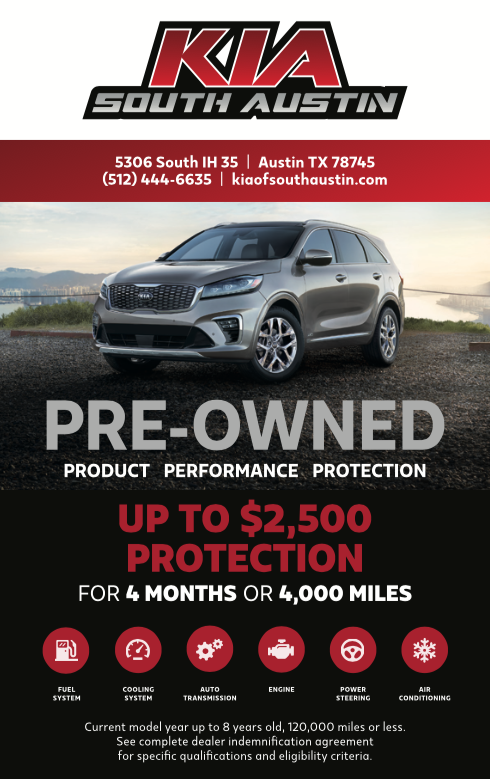 5306 IH-35 South, Austin, Texas 78745 512-444-6635 www.kiaofsouthaustin.com When you purchase a vehicle with the CARFAX Buyback Guarantee, you're getting what you paid for. 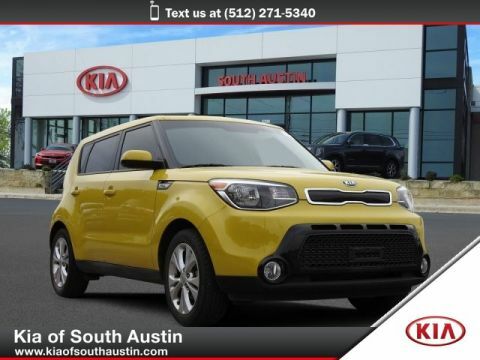 This exceptional 2018 Soul Base has passed the Kia stringent standards and has been hand-selected to become a Certified Pre-Owned vehicle. The quality of this vehicle will undoubtedly ensure a worry-free buying experience. 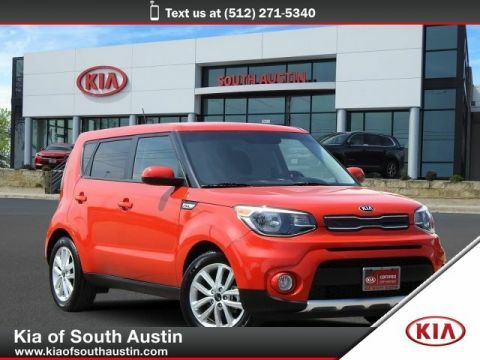 Based on the superb condition of this vehicle, along with the options and color, this Kia Soul Base is sure to sell fast. 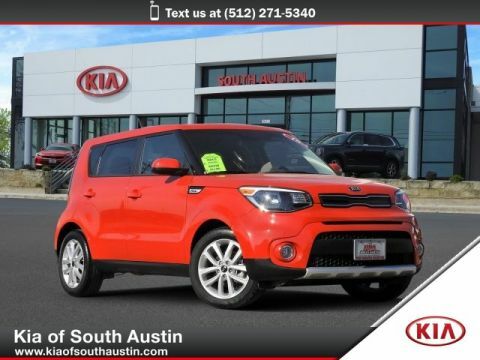 The quintessential Kia -- This Kia Soul Base speaks volumes about its owner, about uncompromising individuality, a passion for driving and standards far above the ordinary. We are on The Magnificent Motor Mile!!! !